Let’s start with the onCreate method of the main activity code. // When working with the camera, it's useful to stick to one orientation. // ...and the notification bar. That way, we can use the full screen. // Now let's create an OpenGL surface. // To see the camera preview, the OpenGL surface has to be created translucently. // The renderer will be implemented in a separate class, GLView, which I'll show next. // Now set this as the main view. // ...and add it, wrapping the full screen size. When I was writing this, I was wondering why I had to set the GL view first and then add the preview because actually I want to have the preview below the GL surface, so this looks a bit strange to me. I didn’t find an answer on that one yet, but it works that way. The rendering is implemented in a separate class GLClearRenderer which is pretty much like the one used in the GLSurfaceView introduction. It’s trivial since I’ve used it only for testing purposes. A real application would most likely subclass GLSurfaceView, too, in order overwrite onTouchEvent etc. // This method is called per frame, as the name suggests. // For demonstration purposes, I simply clear the screen with a random translucent gray. // This is called whenever the dimensions of the surface have changed. // We need to adapt this change for the GL viewport. // No need to do anything here. If you comment out adding the camera view in onCreate, you will already be able to run the application and see the flashing screen. Now for the last part, the camera access. As you’ve seen that earlier, the whole logic is implemented in CameraView. 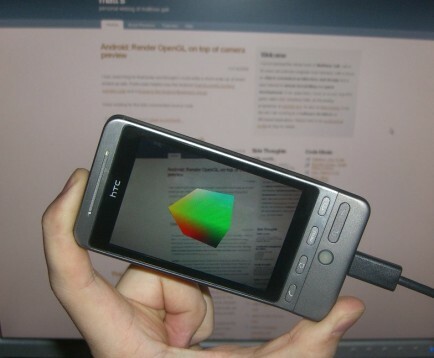 Thanks to Androids easy-to-use camera API, rendering the preview into a surface is straightforward. // about certain surface events. // all buffer data from another component - the camera, in this case. // Once the surface is created, simply open a handle to the camera hardware. // This method is called when the surface changes, e.g. when it's size is set. // We use the opportunity to initialize the camera preview display dimensions. // images to the surface. // the whole camera since we no longer need it. but that doesn’t work. The camera view comes back up onResume, but the glSurfaceView doesn’t. as a workaround. The issue is called “context loss”. I have tried to modify this code to create the views in XML instead of inside the main activity but I have had no luck. I though I understood creating views in XML but I guess not. Most successful examples I have seen use the following strategy. 1. In your main activity, set as the main view the GLSurfaceView object using the setContentView method. 2. Then, add the SurfaceView being used to draw the camera. 3. Add other SurfaceViews to the display as necessary. I have been facing a problem in implementing this. If anybody here has the whole code, please share with me. Do you have a similar code for OpenGL20?